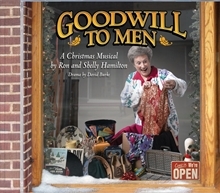 This first-rate Christmas musical drama is set in a second-hand store. The beautiful yet powerful blend of new melodies with traditional Christmas carols makes the simple staging come alive with meaning. The drama requires only a handful of actors, but the impact of the story will be great and long lasting. The message has an appeal to both the believer and the unsaved, with a clear call to action on the part of both. The songs are all that you have come to expect from the Hamiltons, and they will be an inspiration to your choir as well as the congregation.